The group was going after a Guinness World Record and raising awareness about a debilitating disease. Running a marathon is an accomplishment in itself. Running a marathon tied to 112 runners is a whole other story. When earning a Guinness World Record and raising awareness about a debilitating disease are both on the line, however, a Calgary man says the feat is worth it. Blaine Penny, the man behind the stunt at the Calgary Marathon on Sunday, told the Calgary Eyeopener it almost didn't happen. "To put 112 people at the start line and say go and finish a marathon is one thing, but to tie them all together and to work together as a team… was something I thought would be a great way to pull people in," he said. 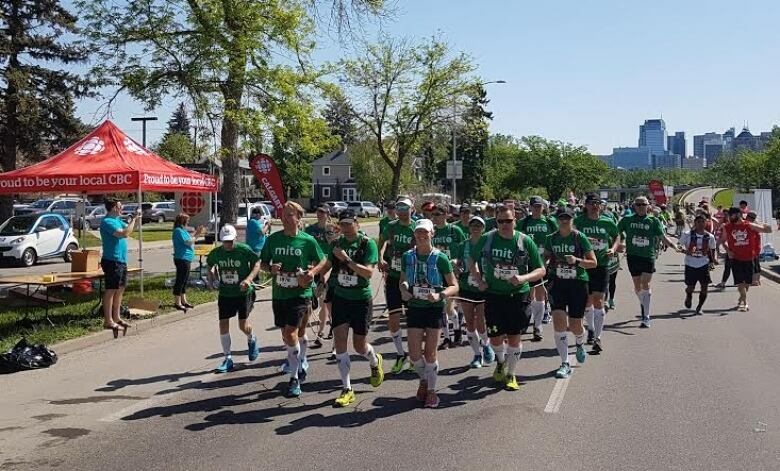 "Team Mito" included racers of varying ability tethered together with surgical tubing; one first-time marathoner was 15 years old, while the veteran 80-year-old was urging the cluster along, according to Penny. "The main driver for this whole thing was to raise awareness for mitochondrial disease, which is a disease my son suffers from," he said. "We've just tried to look at unique ways that we could stand out to gain that awareness and fundraise." There were three pre-planned bathroom breaks throughout the race when they were allowed to de-link without disqualifying themselves from breaking the record. Penny says the most difficult moment of the race occurred on Memorial Drive near Kensington when one racer got heat stroke. Someone went into a nearby home to bring ice and cooled him down before continuing on. In the final kilometre, two racers had muscle cramps. Penny says they unofficially met their goal and broke the record, with the entire group crossing the finish line. The group is waiting to hear from Guinness to officially ratify the record. An earlier version of this story said there were 113 runners, as opposed to 112.